Abnormal mold activity in a home or business can have serious, negative implications if not resolved quickly and appropriately. At MasterTech we understand and appreciate that you have high expectations when it comes to your property and your family. That is why our team of certified mold experts have worked hard to carefully develop mold inspection and mold removal processes that optimize safety, efficiency, and effectiveness. While exceeding your expectations is important to us, what is more important to us is you and your family’s safety. If you are detecting signs of potential mold development in your Mount Ephraim residential or commercial property, your first step should be to consider contacting a certifiedmold professional. You may able to handle cleaning small, minor cases of mold development on hard, non-porous surfaces. However, larger, more serious mold development require mold experts who are properly equipped with the right tools and skills to properly handle such a problem. If you think you have extensive mold development, call MasterTech to speak to an expert and schedule a Mount Ephraim, NJ mold inspection. Every member of the MasterTech Team is meticulously trained and certified to complete comprehensive mold inspections and to properly resolve all mold-related problems. Your MasterTech inspector will conduct a full visual assessment to identify any mold-promoting conditions (i.e: signs of water damage). With the use of moisture meters and thermal imaging readers, your inspector will be able to isolate all damp building materials and track the course of the water migration. If necessary, samples can be collected and tested for additional information as to how to proceed. 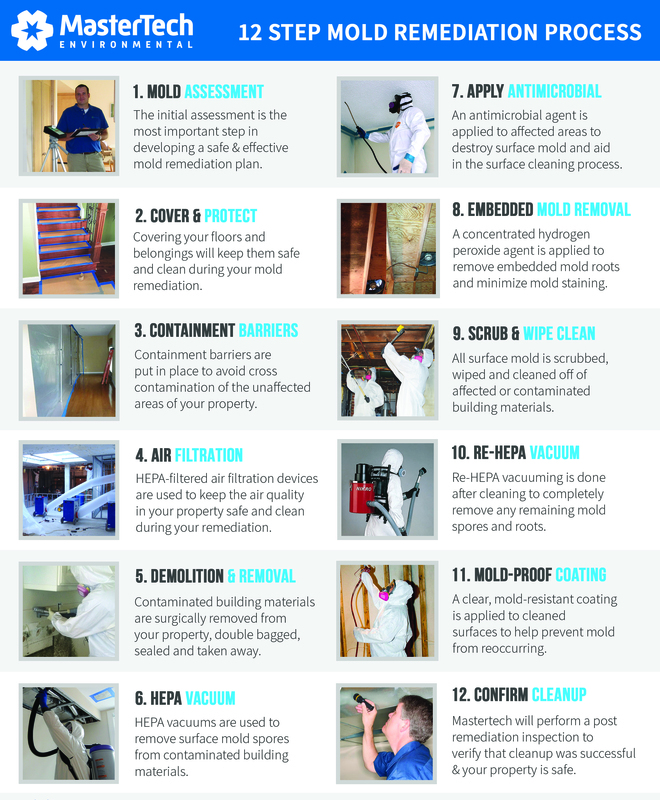 All the information gathered during the mold inspection will be compiled into a clear and concise report. Your inspector will present you with the report and carefully walk you through the findings and what they mean. Upon request, your MasterTech inspector will develop a detailed scope of work for Camden County, NJ mold removal and remediation. In some cases, it can be difficult to differentiate between mold or some other substance. Mastertech provides mold testing to Mount Ephraim, NJ residential and commercial buildings. Through the collection of surface and air samples, we will be able to identify mold species and determine if the spore counts are above normal for your area. The data from the lab analysis will help us develop a plan of action to properly remove the mold from your home safely and effectively. The MasterTech Team of certified industry professionals have taken years of industry experience and research and created a mold removal process that promises the safest, most efficient, and most effective mold remediation from beginning to end. The detailed scope of work for each mold remediation in Mount Ephraim, NJ will include: identification and treatment of all areas of concern, a safe, efficient, and effective cleanup, and recommendations for preventative measures that will hinder recurrence. Our 12 step process ensures control of the problem through proper containment and protection of your Mount Ephraim, NJ property. Our technicians will take care to complete a thorough cleanup and proper disposal of all contaminated materials. Once the work is complete, we confirm the job was done right with post verification testing. As proof of our commitment to providing the highest quality mold remediation available in Camden County, NJ, each of our mold remediations are back by a 5- year mold-free warranty. The key to mold removal Mount Ephraim, NJ is diagnosing the causation. During the MasterTech inspection process, your inspector will piece together all the information gathered to get a general idea of the moisture source. Then, during the mold remediation, our technicians will be able confirm the moisture source. With that information, our team will be able to provide you with all the appropriate recommendations for mold prevention in the future. At the end of the day, if the water source is not found and fixed, and preventative measures are not implemented, the mold will inevitably grow back, despite a proper cleanup. MasterTech Environmental is a family-owned business built on integrity. We are one of New Jersey’s top rated Mold Removal Company for residential and commercial buildings. We are dedicated to offering the highest quality of mold removal possible. For mold inspection and mold removal in Haddon Heights, NJ or mold inspection and mold remediation in Somerdale, NJ call 1 (800) 310-3226 today. Our mold inspectors will be happy to walk you through our process, answer all your questions, and schedule an appointment for you.